Materials: Fiddleback figured bigleaf maple with inlaid minerals, shell, and coral. Finished with aniline dyes and tung oil. Comment: This was a Christmas gift to my son Ian before he left Washington to study at The School of the Art Institute of Chicago. 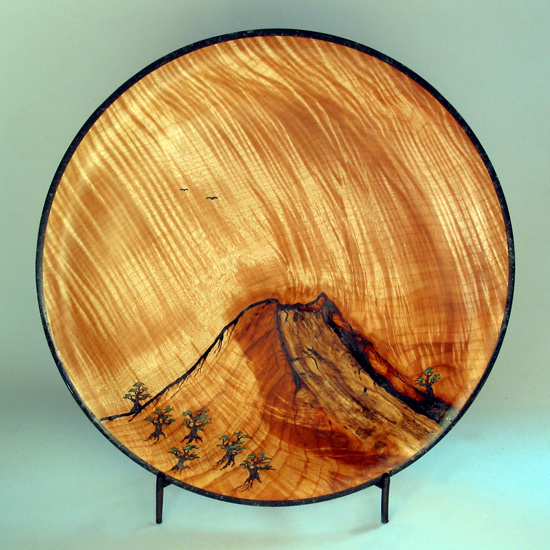 The unusual wood had an old decayed branch that revealed itself as I turned the platter and therein was a mountain. The birds represent my sons leaving home for an unbounded future.